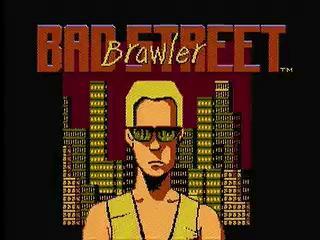 Released in 1989 by Beam Software, Bad Street Brawler is one the few Nintendo games released with specific Power Glove functionality. Given that, it should come as no surprise that this game is so bad, but whether that's in the 80s sense of the word or the Webster's sense is up to interpretation. The plot synopsis speaks volumes: you are Duke Davis, former punk rocker and world's coolest martial arts vigilante, and you're out to clean up the streets of your fair city with some non-stop martial arts madness. No, really, I wish I could make something like that up. Best time: 0:15:39 by Josh 'funkdoc' Ballard on 2012-02-05. Though this wasn't exactly a childhood game of mine, I had known about "DUKE DAVIS, former punk rocker and the world's coolest martial arts vigilante!" ever since the days of Seanbaby's worst NES games list. When I finally beat it I learned how hilarious the game really is from top to bottom, and after the likes of Jim Power it was only natural that I'd get to this eventually. SDA's announcement of Awful Games Done Quick just made it happen that much sooner! I finished a run last summer but never submitted it, and that turned out to be a good thing. With some new things I found after AGDQ and improved execution, this one ended up over a minute faster! In this game, you have 3 moves (A, B, A+B). The unique twist, and an idea I really wish an actual good beat-em-up used, is that your moveset is different in each stage. There are a couple stages where you're stuck with nothing but garbage (here's lookin at you, 10!) but it works well for the most part. The best moves tend to be the ones that do damage quickly and/or allow for infinite combos. These include the Ear Twist, Trip (or as in AGDQ, "The Fondle"), and even the basic punch. The Gut Knee can juggle infinitely, but it knocks enemies down for a long time. The Macho Man elbow can jump over bullets but has the same knockdown problem. The headbutt can't infinite but does lots of damage quickly, and the piledriver is similar but slower. The Arm Spin is usually terrible since it takes forever to do damage and you can be hit out of it, though it plays a role in stage 10. The Stooge Hit is also quick damage but has the most awkward hitbox, and the Roundhouse Kick has the same problem. That should about cover it. Oh yeah, and the Bull Ram. As it turns out, the NES can't handle DUKE DAVIS's affinity for the crotches of purple mohawked punks with baseball bats, so repeatedly doing that move causes the kind of fun you see on stage 4! It can be done on any stage where you have that move, but since it crashes the game 90+% of the time I only went for it once. Occasionally it can overclock the NES just for that stage and help your time a little bit, but that's extremely rare. The most annoying enemies in this game are the breakdancing Edgar Winters (can't be hit while funky, funk leaves you spinning in sheer awe), the black SS troopers (can't duck their bullets), and the knife grrlz (infinite combos). The others definitely have their moments, though. As for levels, stages 10 and 15 tend to be the roughest. The former is due to your god-awful moveset, and the latter is because they throw 2 breakdancers (let's call them the Rock 'n Roll Express) at you right at the start. Item drops are a bit tricky to handle. The screen won't scroll until all items are gone, but you spend time after each stage throwing away all the items you picked up; generally I don't pick up items at the left end of the screen but get most others. And at the end of most stages it's fastest to jump forward and grab the item. That should be about it. Thanks to SDA and SRL, as well as jedpossum for figuring out how to do the secret Power Glove attack (sadly it's left+right). If you're interested in more speedruns of obscure and classic retro games, follow my stream at http://www.twitch.tv/srkfunkdoc !